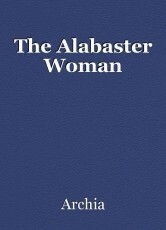 The woman was kneeling with an alabaster jar in her hand and a twisted chin on her face. Under her left arm, the arm she was using to tie up her alluding hair, was a map. On this map was not directions for travelling but directions of the world. Why should one who does not travel but merely washes feet need a map with directions? All that should be needed was life and with the claims to life under her arm she could have everything that could be thought to be needed. She swatted the last strand of hair into place and poured salty water onto the feet of the man before her. Reaching under her arm she took the map and, without a thought to what the paper contained, begun to dry his feet. As what happens when water touches paper the ink ran, tears and tears creaking down its breadth. The woman, so unaware of the unseen ink spoiling inside the folded paper continued to wipe the water from his feet. When she saw it begin to crumble beneath her fingers she threw it aside, the map like a leaf tossed in the wind. If she had known what directions she had thrown away would she still have done it? Or would she, with a zealous passion, poured over the map, attempting to turn her life to meet every point on the compass. With each turn, though she would not have realised, she would have neglected the feet of the man who was now rising before her. He pulled her humbly to her feet, and as she looked to the ground he lifted up her chin. The directions of the world lay in a crumpled state by the side, ink drooping and illegible. The map of the world was, in a twisted fate, ignored. It would never be this map that told of turns and points and works that would be needed for life, but to instead humbly see where grace truly lay. A/N This story needs some explaining (well maybe not if you think so but I doubt all my intentions came through clearly). Frankly I am not fond of stories which need an essay attached to be understood- if it can’t be explained in the story then what’s the point of it- so I apologise for this. So first things first, I begun to write this when I was sitting in a medieval history class that was about maps. The class was not travelling in the direction of entertaining hence I wrote this. What I found interesting, before my mind trailed off, was that many maps weren’t used for travelling. They told stories and history which were entwined within places. Because of the time period they had highly religious purposes and a lot of this was incorporated into the map. The second context in which I wrote this was because earlier that day I had done a speech (which frightened me to the core) on Jesus Christ Superstar and it’s accuracies. I had looked at the part in the Bible where a woman anoints the feet of Jesus with expensive oil (in John 12). So that was in my mind and that is essentially the basis for the story. I really wanted to express the point that at the end of the day it’s not rules or following which saves you (which is at least what I believe, it depends of course on personal belief). In the Bible verse the woman that washes Jesus’ feet wasn’t caught up in the greed of the world nor what others might say is right but saw what was truly important which is the saving grace of Jesus. This is what happens when I start writing during uni after a stressful day. I know this may not be the greatest story I’ve ever written, I know it may not make sense without this explanation (and even then it may not make sense), but it was one of the rare stories I wrote with a purpose in mind (instead of my normal rambling) so I thought I’d share it anyway. I would love to know what anyone thinks of this, especially what people thought before they had read the explanation. As always any thoughts, comments, ideas or general whatnot is appreciated. I did wonder if anyone would get the title and I'm glad you did. Thanks so much for reading. I do like your style. I found it hard to read, in a noisy library. Good work. Keep the Faith. A noisy library can never be fun. Thank you for reading regardless of the area, it's appreciated. I really enjoy your writing. Keep it up! It's definitely not stealing, I'm honoured. Whatever you do I would love to read it if you put it up. Thank you so much for reading, I'm glad that you got the point through it all. Christianity and Giving - A motivational short story. Learn the Truth of God's Word.